There are no strange additives, artificial sweeteners or crazy colorings in this ice-cream. It’s simply some home-made custard, fresh juicy peaches, a little lemon juice and sugar. This ice-cream has the pure taste of peaches and cream, and it tastes utterly divine. When you have a glut of peaches in the summer, there is no better dessert to make. I made this peach ice-cream recently and we devoured it all in a week. It’s delicious served with fresh peaches, or sweet summer berries. I made the custard in my SousVide Supreme and it was the perfect base for this peach ice-cream. I usually hate making custards on the stove-top, as they so often curdle or don’t thicken properly. By cooking the custard in the water oven, I know my custard will turn out perfectly. Making custard based ice-cream has now become a simple task. It really is just a case of making the custard, adding some fruit, and churning. I find it hard to justify buying ice-cream anymore, as it’s so simple to make, and I can use the freshest of ingredients. 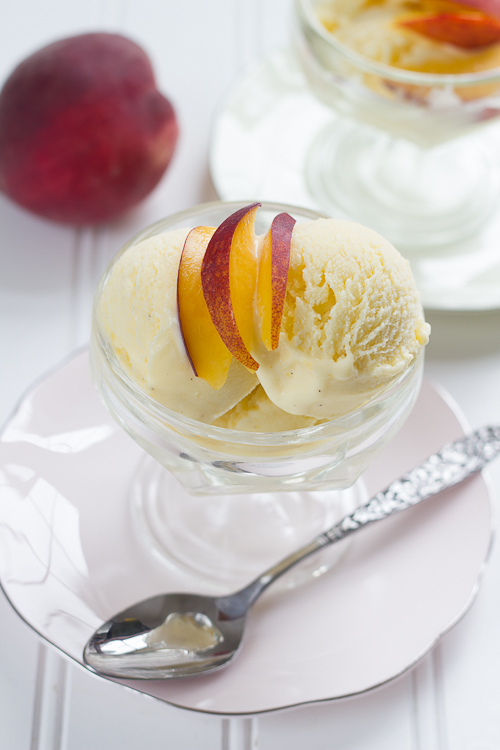 This peach ice-cream is mouth-watering and delicious. If you have some fresh, ripe peaches, this is a great summer dessert to make. 1. 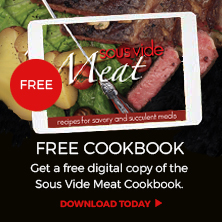 Fill and preheat the SousVide Supreme to 185F/85C. 2. Put the milk, sugar, eggs and vanilla into a food processor and blend for a few minutes, just until well combined. You want to mix the custard, but not over whip it. Add the cream and pulse to combine. 3. Divide the custard mixture between two small (quart /0.95 liter) zip-closure cooking pouches. (I prefer to divide the custard into two batches, as it is easier to work with.) Use the displacement method (Archimedes’ principle) to remove the air and zip the seal closed. 4. Submerge the pouches in the water bath for one hour. 5. Remove the custard from the water bath and quick chill the pouches, submerged in ice water (half ice/half water) for an hour. 6. Transfer to the refrigerator to chill for 8 hours or overnight. 7. Meanwhile, skin the peaches using a tomato peeler, or by blanching in boiling water. Remove and discard the stones. 8. Mash the peaches with a fork. 9. Add the sugar and lemon juice to the mashed peaches. 10. Put the mashed peach mixture into a bowl and put in the fridge until you are ready to use it. 11. Once the custard has cooled overnight, strain it through a sieve into a large bowl. 12. Strain the juice from the mashed peaches into the custard and mix together with a spoon. Reserve the mashed peach. 13. Pour the custard into an ice cream maker and churn according to the manufacturer’s instructions. 14. Once the ice cream has been churned for about 5 minutes, pour the mashed peaches into the ice-cream and continue to churn, until frozen. 15. Transfer the ice cream to a freezer-safe container with a lid and pop into the freezer for at least 2 hours. 16. 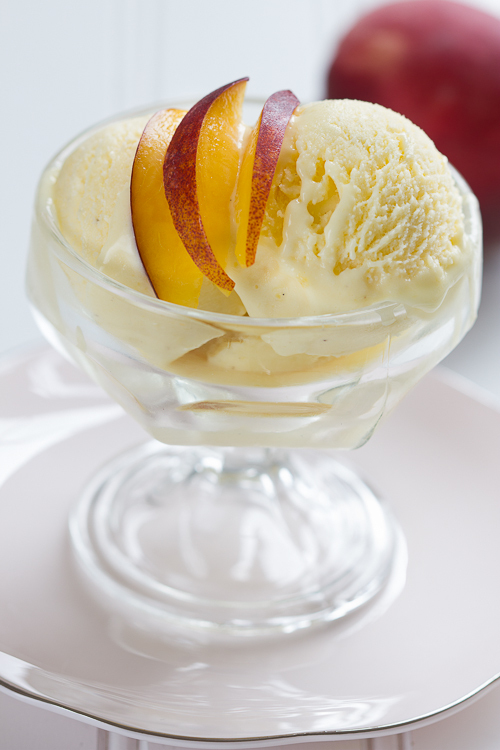 To serve, scoop the ice cream into dishes and garnish with fresh peach slices.